in the Aerospace Industry. ID AERO provides the most extensive information on the civil aviation, aerospace and defense industries. From plane to engine makers, from maintenance specialists to component manufacturers, from airlines to airports, from multiple small suppliers to massive institutional players, we cover economic, financial, technical, social and political data, which we collect, order, analyze, sift and cross-connect. 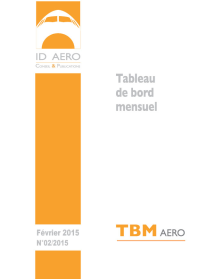 ID AERO publications highlight trends and explanatory factors. Based on the on-line databases mined by our in-house Watch department, our forward-looking scenarios, kept under constant review, offer insight into potentialities and make a valuable contribution to strategic decision-making . TBM Monthly Bulletin provides readers with a global overview of the aerospace industry. The Monthly Bulletin also evaluates likely trends and forward-looking scenarios. TMB is written in French. 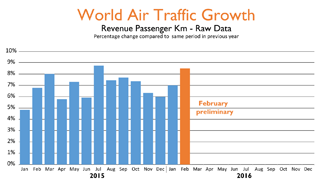 Monthly Traffic data Report (MTdR) is an independent global air traffic indicator. Data is broken down by region and is built up from a monthly compilation of around 1,600 sources, drawn from some 150 airlines. MTdR globally covers more than 90% air passenger miles, including low cost operators. View the world's commercial jet and turboprop fleet. 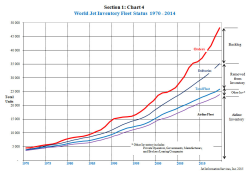 WJI reports the status of all Western built jets, 30 seats and above, and recent large turboprop models. Selected Russian, and new regional Asian aircraft are also included.